This article is about trade routes. For using salt to de-ice surfaces, see magnesium chloride. A salt road (also known as a salt route, salt way, saltway, or salt trading route) refers to any of the prehistoric and historical trade routes by which essential salt was transported to regions that lacked it. The Via Salaria, an ancient Roman road in Italy, eventually ran from Rome (from Porta Salaria in the Aurelian Walls) to Castrum Truentinum (Porto d'Ascoli) on the Adriatic coast - a distance of 242 kilometres (150 mi). A modern road by this name, part of the SS4 highway, runs 51 kilometres (32 mi) from Rome to Osteria Nuova in Orvieto. 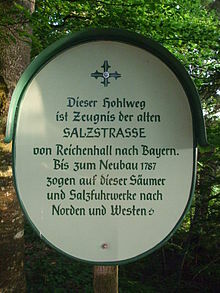 The Old Salt Route, about 100 kilometres (62 mi), was a medieval route in northern Germany, linking Lüneburg (in Lower Saxony) with the port of Lübeck (in Schleswig-Holstein), which required more salt than it could produce itself. Lüneburg, first mentioned in the 10th century, grew rich on the salterns surrounding the town. Traders shipped salt via Lauenburg, to Lübeck, which supplied all the coasts of the Baltic Sea. Lüneburg and its salt were major factors of power and wealth of the Hanseatic League. After a long period of prosperity, its importance declined after 1600. The last of the salt mines was closed in 1980, ending the thousand-year tradition. The salt highways of Europe were the navigable rivers, where by medieval times shipments of salt coming upstream passed rafts and log-trains of timber, which could only be shipped downstream. And even along Europe's coasts, once long-distance trade was revived in the 11th century, the hot and sunny south naturally outproduced the wet north. By the Late Middle Ages the expanding fishing fleets of the Low Countries required more salt than could be produced locally; the balance was made up with salt from the Iberian Peninsula: "The United Provinces could have been brought to their knees if their supplies of salt had been blocked at the end of the sixteenth century. Spain did no more than dream of this," Fernand Braudel has written. In Ming China, salt as well as rice was shipped from south to north, along the Imperial Canal as far as Beijing. "no salt mine was ever abandoned and the scale of the equipment needed put these mines in the hands of merchants from very early days. Salt-marshes on the other hand, were exploited by artisanal methods: the merchants took control only of transport and marketing, both in Setúbal in Portugal and in Peccais in Languedoc. Salt marketing was probably quite big business along the Atlantic seabord or the Rhône valley." The vast interior of Poland was salt-starved, its maritime districts lying under rainy skies and fronting the Baltic Sea. By medieval times the process of mining for fossil salt supplemented the age-old techniques of evaporating sea salt in tidal pans. By the 14th century, at Wieliczka near Kraków, Braudel reports that peasant extraction of salt from brine evaporated in large shallow iron pans had been eliminated by the early industrialisation of salt mining. "Galleries and shafts were now dug to a depth of 300 metres, and enormous winches powered by teams of horses brought blocks of salt to the surface. At its peak, production stood at 40,000 tons a year and the mines employed 3,000 workers. By 1368, the cooperation of the Polish state had been obtained." ^ Pankhurst (1968), pp. 461ff. ^ In the tenth century along an established salt road mule trains brought firewood from the Rouergue to the deforested Mediterranean ports and returned laden with salt. ^ Braudel (1982), p. 178. ^ Braudel (1982), p. 353. ^ Brouage and Bourgneuf were specialised in the mass production of sea salt, according to Braudel (1984), p. 208. ^ Braudel (1982), pp. 327f. ^ Braudel (1982), p. 322. Braudel, Fernand (1982). The Wheels of Commerce. Civilisation and Capitalism 15th–18th Century. vol. II. New York: Harper & Row. Braudel, Fernand (1984). The Perspective of the World. Civilisation and Capitalism. vol. III. New York: Harper & Row. Pankhurst, Richard K. P. (1968). Economic History of Ethiopia. Addis Ababa: Haile Selassie I University. This page was last edited on 24 June 2018, at 00:36 (UTC).